Time well spent makes us happy. If we feel accomplished, if we do things on our “lists,” it makes us feel that we’ve spent our time well. Most of us say we need more time each day, we can’t finish out tasks, we run out of time. How can we add more time to our days? Sponsor: Media Angels, Inc. Novels – Truth Seekers Mystery Series available on Amazon. Three novels for tweens! When I look at my day I think, “What is the best use of my time each day?” Other than with my friends and family the best time is with God. How can you fill up without the One who truly gives us that grace to get through each day? Who do you spend time with and is that time well spent? In this episode, we explore how you can make the time. Let’s strive to make the most out of every minute of every day. Look at your day, how can you incorporate time well spent? We all say we don’t have enough time each day! Identify the time wasters. Relaxing is wonderful for everyone and we don’t need to “produce” every day! However often we say we don’t have enough time for prayer because we don’t use our time wisely. What is the one thing you can avoid? Is there something on your list that you can eliminate or reschedule in your day so that you can make more time? Can you make 5-10-15 minutes or more to spend with God in prayer? Look at your lists above and see where you can add more time to your day. Five, ten or fifteen minutes helps tremendously! 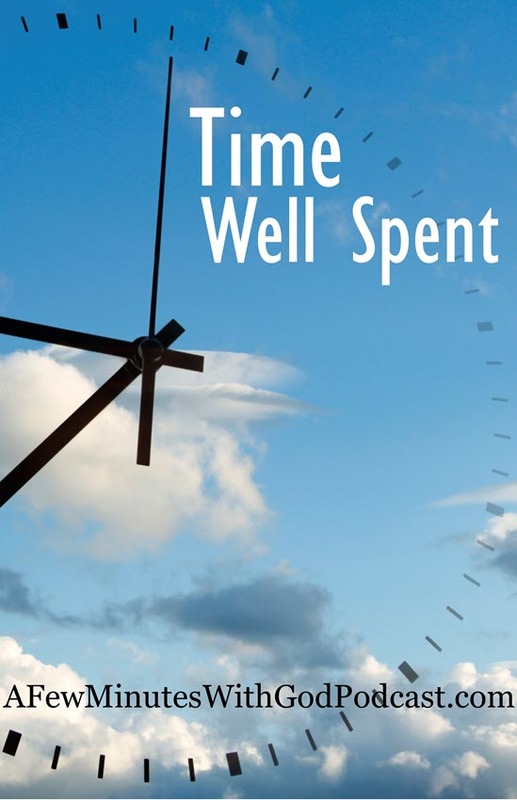 Time well spent with God is so helpful in our day. Often we leave prayer time to night time. Praying in the morning, the first thing you do — will change your life and is truly time well spent. Who do you spend the most time with? Is it family, friends, virtual friends? Ist it fictional characters in books? Truthfully, sometimes we let virtual friends take the place of real ones. I have good friends online, some I’ve never met in person. Nurture your friendships but remember the one who will fill you with faith, love, and joy. How can you make that time productive? Spending it with God first will increase your productivity all day long. Can you be a witness or a blessing from the Lord to someone in your life? Do you ask God to use you each day? Do you see the people in your life as a blessing? How can the Lord use you? How can you be an example of God’s love to others?